A pale gold anodised aluminium General Service Corps headdress badge, being the Royal Arms (QEII) with Queen's crown Crest. A pair of lugs on the reverse. 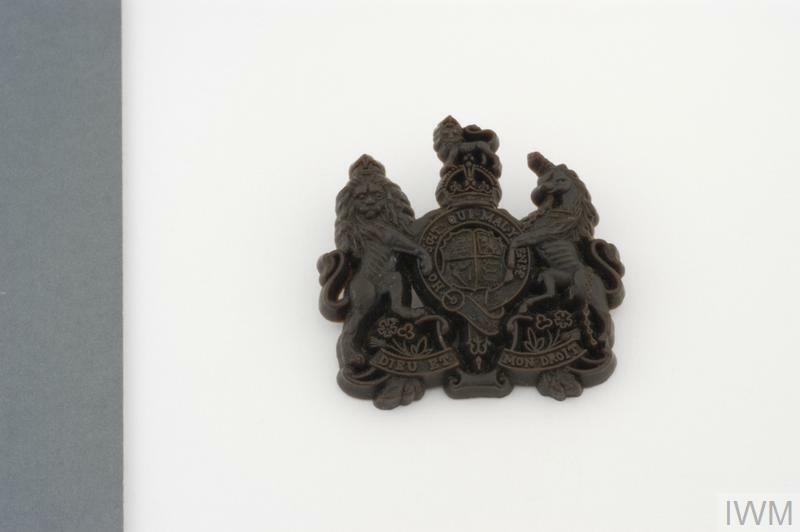 From autumn 1914 a cap badge consisting of the Royal Arms (with a King’s crown) was worn by officers on the “General List”. This list first appeared in the Army List in October 1914 and identified “officers who have been gazetted to the General List for service with Service Battalions, but whose allocation is not included in this issue.” In February 1915, the list was extended to include the names of officers “who are holding other employments.” The list was, in effect, of a pool of officers awaiting allocation to a regiment or corps. In February 1942 the General Service Corps was established for a similar purpose, as a “Reception Corps” to administer recruits, this time of all ranks, before allocation to field force units. They wore the same pattern badge as those on the First World War “General List”, soldiers’ badges being in brass or gilding metal, officers in gilt or bronze. The General Service Corps was primarily intended to deal with the inevitably large throughput of personnel at times of war, but since the end of World War Two it has remained in being for the few officers awaiting allocation at any one time. A version of the badge with a Queen’s crown and Elizabeth II Arms was introduced around 1955. A soldier’s anodised aluminium version of this latter badge exists and is said to be used on No. 2 Dress and the wrist-band by WO1s of the 9/12 Lancers. A different badge was worn during 1944 and 1945 by those General Service Corps personnel who were part of pre-OCTU Training Battalions. This was the Royal crest on crossed swords and the pattern was sealed in May 1944. The badge was perpetuated after World War Two for wear by the Infantry components only of Junior Leaders Training Regiments. This pattern, with a Queen’s crown, was sealed in November 1958. It exists in gilding metal and anodised aluminium.